14 x 5 inches, oil on board. The last painting from my camping trip. 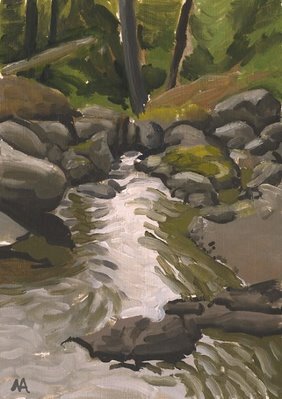 I taped two 5 x 7s together, found a spot where I could lean against another trunk and look up, and painted this pretty quickly, due to the discomfort. I like imagining what it would be like to be a hawk or eagle and live in the penthouse of one of these things. A couple weeks have slipped by...in that time I packed up and returned to Long Island. Tomorrow I start new paintings, but I still have a couple left from my trip to the Olympics. 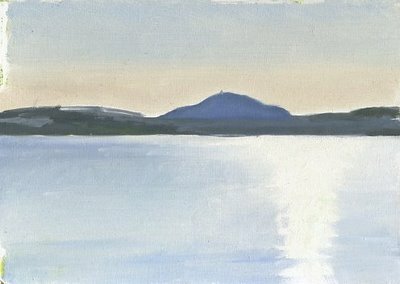 This one's sketchy, but it does catch the light and heat of the afternoons on Lake Quinault on the Olympic Peninsula. Our campground was in a shady patch of trees about 50 feet behind this scene. Jim, Mike and I had great afternoons and evenings swimming in this lake, and after the sun went down, watching the moon and stars rise and move across the sky above. This lake was particularly pleasant, as there were no motorized boats allowed. It is under the jurisdiction of the Quinault Indians, who live on the reservation bordering the west shore of the lake. I don't know what to say about this place. It was peaceful and beautiful. I was really happy every minute there. Not a single leafblower or shopper courtesy clerk.